I can’t say I enjoy cooking-not when I have a baby on one hip, a toddler pulling on my shorts, two preschoolers arguing, and a big kid who loves to chat with me while I cook. I usually can’t think straight and I routinely forget what I’m making. I usually don’t even know what day it is, much less which meal I’m preparing. Is it breakfast time? Or have we moved on to dinner already? I don’t know. There have been a few nights when cereal or oatmeal was the best I could do. Sad! I have printed off a copy of every recipe that has been a hit at our house and put them into the binder. I printed them onto paper with decorative borders and the top of each page has a picture of the dish. (I’m a visual person, so what can I say-I like the pictures!) The best part is that each recipe is encased in a page protector! No more crusty food all over my recipe pages! When planning meals, I used to page through multiple cookbooks, become sidetracked, and waste a ridiculous amount of time. Having recipe binders of our favorite recipes eliminates the hunt through other cookbooks to find inspiration. If we tried a recipe and we liked it, I typed it out, printed it, and put it in our own notebook. I don’t have to look through any other books for my regular meal planning. Weeknights are times for our tried and true favorites. I don’t have time for guesswork! I used to sit for hours and arrange and rearrange my weekly meal plans. I would try to put meals on a calendar and realize that I had planned the same meal more than once. We didn’t want two chicken dishes in a row or two pasta dishes in one week. That’s when I decided that each night would have a theme and that would keep us from having similar meals two nights in a row. Monday – Crockpot meals – Monday is our busy day with swim lessons, violin lessons, and Bible study for me. I need something fast and easy that doesn’t require much prep or clean up. The crockpot is a good friend of mine! Tuesday – Pasta – We love pasta at our house so we have pasta and usually some type of meat. Spaghetti and meatballs is a favorite at our house. Wednesday – Chicken – My kids would eat chicken every single day if I let them. This is one of their favorite nights. They love chicken with various marinades or chicken breaded in crushed pretzels. Thursday – Soup – Even though it might be roasting outside, my kids will always eat soup – especially the toddler. And I can usually hide lots of veggies in the soup. So, once a week we have our soup with a side of chips or bread. Friday – beef – This night we do something with beef (or bison). My kids love tacos, meatloaf, and hamburgers on these nights. Saturday – New recipes – Saturday is my time to experiment with new recipes. I always make sure we have leftovers for lunchtime since we spend all morning at the pool. But I take time in the afternoon to try out new recipes. Sunday – Leftovers and meal prep – I plan to have something as leftovers on Sunday and then we have a simple dinner. I cook things in large batches on Sunday afternoon and evening to prepare for the week and cut down on prep time each day. I also do some baking and make bread, muffins, and sometimes even cookies. By the time I’m done there’s not a clean dish or one inch of counter top space but I’m grateful for the head start when Monday hits. Now that I have my themes for each night, I look over my calendar and plan all my Mondays, then all my Tuesdays, and my Wednesdays, and on through each day. I make sure I choose a variety of meals for each theme so we don’t have the same meal twice in a month. Then I go back through and add fruits and veggies as sides to the meal. I aim for variety each week. Now my dinners are planned! Next, I plan for the breakfasts each week. Tuesdays and Thursdays are usually oatmeal days. Mondays, Wednesdays, and Fridays I usually try to have muffins or waffles with fruit on the menu. I make breakfast the night before and have it ready to go when the kids are awake. I don’t plan for lunches. Lunches are usually leftovers. Boring I know! However, some days we have baked potatoes with different toppings or even sandwiches. When I get desperate I have chicken nuggets that I can always heat up for the kids. The last thing I do is plan our weekend meals. This is my favorite part! I have tons of recipes pinned to my Pinterest boards and I sit down and choose a few new recipes to try for that month. I print off a few to try and then I add them to the calendar. I also choose a few fun baking recipes to try that month. I print those recipes off as well. Both sets of recipes are stapled separately and I write the name of the month at the top of each stapled stack of recipes. I then slip them in the inside pocket of the binders. My goal is to cook or bake all of those recipes for that month. The favorites will get typed up with a picture and printed off on my fun bordered paper and added to our binders. My menu plan is written on a monthly calendar that I printed and laminated. I use the wet erase markers and write dinners and breakfasts in different colors. It’s easy to erase and change a meal if plans change. Then I have to make my shopping lists. I make a list once a week after going through my menu for the upcoming week. And that’s how I keep track of our favorite recipes and the new recipes I want to try. 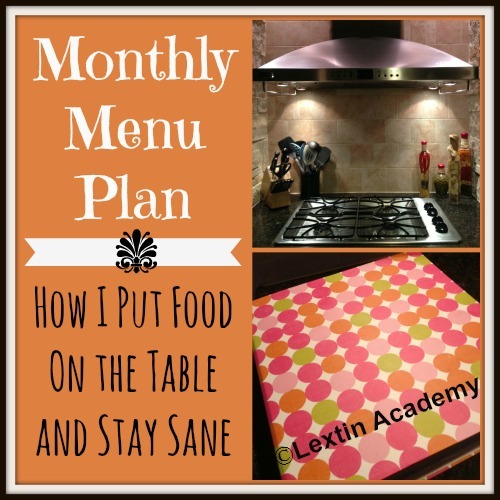 Our system ensures that we have a wide variety of meals each month and I always have a plan so that I can have dinner on the table. We have children with food allergies so quick and easy boxed or frozen meals are not an option – neither is frequent dining out. So, cooking for my family is a top priority and I’ve had to find a system that works. Do you meal plan? Do you plan by the week or month? How do you keep your recipes organized and ensure that you try new things? Great post! I have slacked off with my batch cooking and menu planning. I need to get my groove back because it help the days go smoother. Wow! You're so organised with your meal planning. We just rotate our meals every two weeks. Our kids have certain favorites and we always have a couple of those in a week which we rotate with not-so-favorite dishes. We "taught" the kids not to complain (too much) about food so we don't get too stressed out with meal planning. But we also do "freezer cooking" (or batch cooking) so there's always a fall-back on days when you just don't have the time to cook. Thanks for sharing this post! It looks like you have a wonderful meal planning system in place. I know the order relieves so much stress. I just started back w/meal planning. I also have been cooking through my cabinets rather than going out and purchasing new everything for a meal. I have only been buying a few ingredients if necessary to help me finish a recipe. I tried planning as you do w/a theme for each evening and moved away, because by the time the day arrived, I often wanted something other than what was scheduled. The only thing is that planning like that made my days run more smoothly. Saturdays were so much fun trying out new recipes. I may have to go back to that. We also eat soup year-round and love it. I meal plan by seasons; so I have a spring/summer and a fall/winter menu with shopping lists for each week. I have meals planned out for each of the weeks and just rotate it throughout that season. I may add or take away from time to time. Like you, I try to do a quick meal, chicken,beef, fish(Seafood), pork, international meal (lesson included), and experimental meal. I don't plan specific side dishes unless there is an obvious one. I buy the same veggies mostly and just pull those out. In the summer we have a garden so most of the produce is ours or the neighbors. I LOVE meal planning. I don't dread cooking because I know what I am making and can prepare myself for it. I also want to get into freezer cooking. Its hard with the way we eat though. Hey Kirsten. I'm interested in knowing how you plan your meals seasonally. Is it just a menu of your families favorite meals for that time of the year or something else? Trying to get a mental picture here. For years I've only done shop by the weekly sales menu plans so that's what I'm used to. If you want to explain further in an email just drop me a line (or 2) at tajuanar76@gmail.com.